This Cranberry Apple Casserole Recipe is WICKED GOOD! With a crunchy buttery top, and a tart, sweet, soft center; you will make this recipe again and again! The first time I tried this, I was like, “Hello! Can you please give me some more?” It was soooo WICKED GOOD! 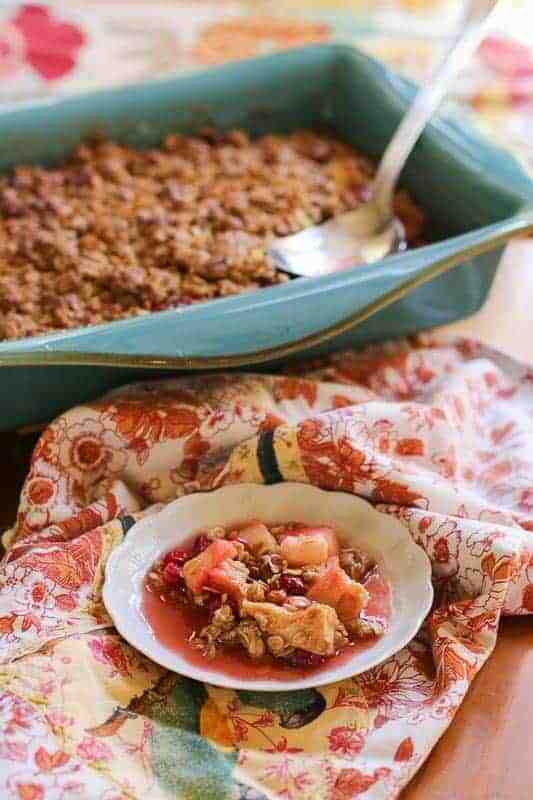 This cranberry apple casserole has a crunchy buttery top with a tart, crazy sweet, soft center. Pucker up and get ready! You will be making this recipe again and again! My husband’s cousin Jennifer Stimpson introduced us to this dish. Jennifer is an amazing baker. She is well favored for bringing something sweet and incredible to share at our family gatherings. And I am always asking her to share those lovely recipes. When she made this Cranberry Apple Casserole, I was trying to behave myself and only have small portions of sweets that day. Well…. one bite of this and I was hooked. I couldn’t control myself. I kept eating and eating it simultaneously saying, “OH MY GOSH, I LOVE THIS!” This recipe really should be called, “CRANBERRY CRACK! 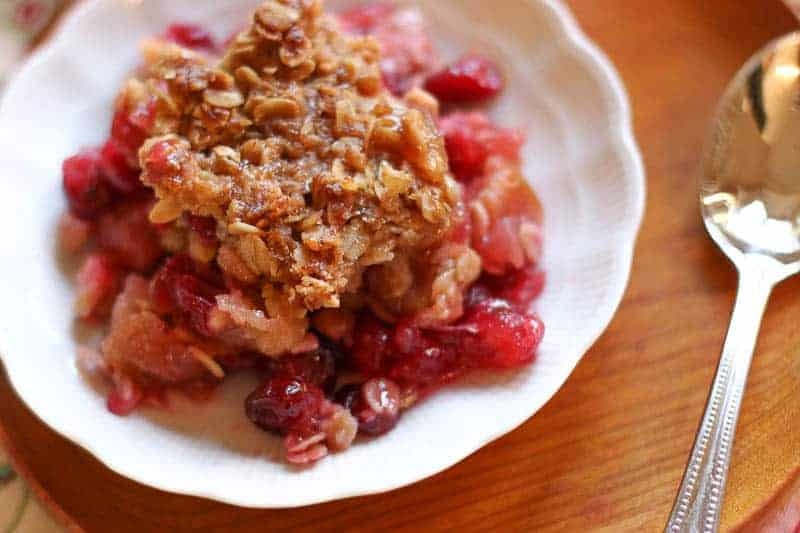 I am all about sweet and tart combinations; add in the crispy, buttery, oatmeal topping and BOOM! This is a very easy recipe. It is great for potluck dinners, entertaining, and/or dessert. But don’t wait for a special occasion. Go ahead and make the Cranberry Apple Casserole now! 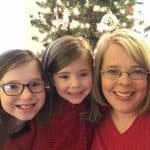 For other great family recipes, check out: Granny Moore’s Dressing, Grandma Kriz’s Hash Brown Casserole, and Candy Bar Cream Cheese Fruit Dip. Grease baking 13x9 baking dish. Peel and chop apples. Mix with cranberries. Mix sugar and 1 tbs flour. Mix in with cranberries and apples. Add cranberry and apple mixture to baking dish. In a separate bowl, mix butter with oatmeal, brown sugar, and 1/3 cup flour. 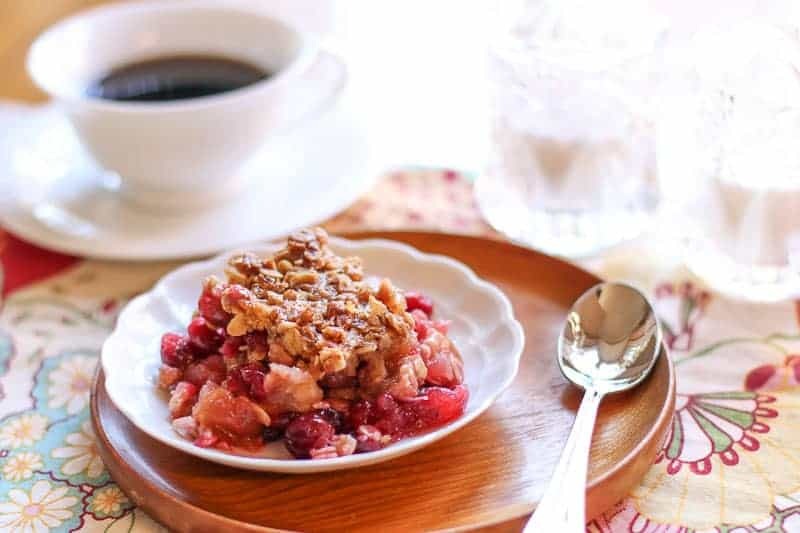 Crumble oatmeal mixture over cranberry apple mixture. Bake 45 to 55 minutes or until fruit is perfectly tender. Has anyone tried to make this in a slow cooker?? This awesome dish will be a part of our family’s Thanksgiving tradition. It is delicious. OH my. This recipe sounds so delicious. Looks amazing. Your husband’s cousin is such a kind lady. Thanks for sharing with us. You had me at “buttery”…then you added my fav holiday ingredients! Seriously, so yum…I wish I had some right now. Thanks for sharing! Cranberry, apple and oats sound like a match made in heaven. It’s the perfect Christmas treat! This looks absolutely delicious! I’d love this for breakfast or dessert…or both! This recipe is sooo perfect for this weather! A great holiday recipe. BTW, yummed, pinned & added to my FB page, hope it`s ok.
Hi Katie, I think this is a must add to my holiday menu!! &… such beautiful photo`s, I`m so envious!! 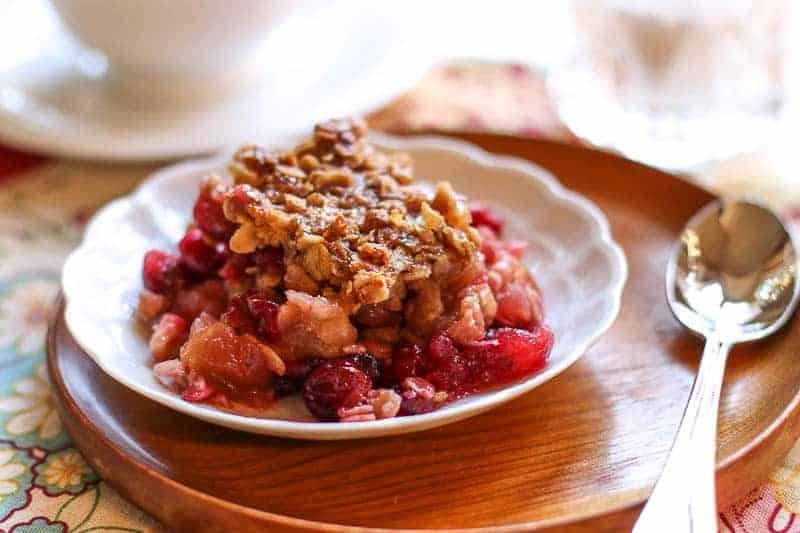 I love cranberry and apple together and this casserole sounds amazing! Bring on the tart, I’m so ready for this! I can see, too, how it would be absolutely addictive. YUM!